Kick off the holiday season at the community Holiday Tree Lighting Celebration, Saturday, December 1, 2018. 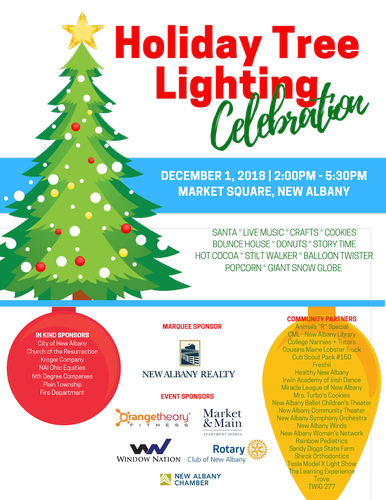 Bring the whole family to enjoy ice sculpture demonstrations, bounce house, giant snow globe, kids crafts, donuts, popcorn, cookies, apple cider, hot cocoa, coffee, cookie decorating, stilt walker, balloon twister, holiday dog treats, reindeer treats, kids ornament decorating, Tesla Model X Light Show, and holiday cheer from event sponsors and community partners. Be there when Santa arrives at 2:00pm on his sleigh (fire truck)! Mayor Spalding lights the tree!